This is classic Nokia, a light handset with smooth lines that’s good looking to boot. This is a highly accessible handset with an intuitive feel and calls pushed to the front. The Nokia C5 is light on features by design, but there are a few extras including GPS, Bluetooth, a 3.2-megapixel camera and FM radio. The Nokia C5 performs quickly and well with minimal effort from the user. Very effective. Excellent battery power, with up to 300 minutes’ talktime. Nokia’s range of classic handsets, the C-series, is designed for those who want a simple, easy-to-use handset that brings making and receiving calls to the fore and look stylish to boot. 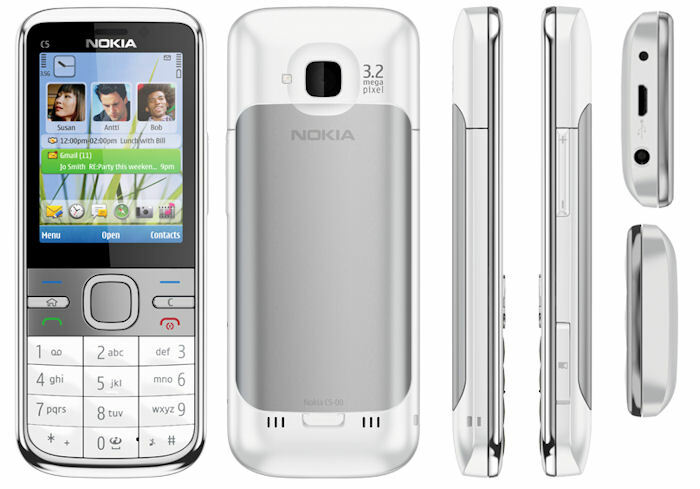 The latest in the range, the Nokia C5, has a Symbian S60 operating system, although it is definitely not a smartphone. It does however, feature GPS and Ovi Maps, which turn it into a satnav. And because you can use Ovi Maps offline, without the need to download data as you go along, you can use it more or less anywhere in the world for no cost. The candybar Nokia C5 resembles the Nokia 6700 but has the same matte silver backing as the 6700 Slide. The colourful 2.2-inch screen has a muted quality about it that can’t compare to the latest generation of super AMOLED screens, but that’s to be expected from a phone at this price point. Large, blocky keys make typing straightforward too, in line with its user-friendly remit. One nice touch, also seen on the 6700 Slide, is the introduction process, which kicks in the first time you switch on the phone. It gives you step-by-step instructions on transferring your contacts and personalising your phone, including setting up email and choosing a wallpaper and ringtone. Nokia’s Switch application, which transfers contacts between compatible Nokia handsets, is present on the Nokia C5. And, like the 6700 Slide, a row of shortcut icons run along the bottom of the screen, only this one also has an Ovi Maps icon. No touch-screen means you navigate maps using the keys. This, along with the maps’ basic appearance and the small screen, make the app somewhat low-key and less easy to interact with. It’s unlikely to be a replacement for your regular satnav, but is nevertheless useful for occasional location checks. The apps icon in the menu leads you to email, Facebook, document viewer and more, and access to the Ovi Store, via another icon, means you can download a range of new apps including a handy app that helps you remember where you parked and another that turns your screen into a mirror. For internet browsing you get HSDPA data speeds of up to 10.2Mbps, depending on coverage. In reality, there’s not much chance of reaching these speeds, but it’s good to know it’s there. A stereo FM radio is a good extra – enhanced by the welcome addition of a 3.5mm audi jack so you can plus in your own headphones – and the 3.2-megapixel camera with LED flash produces relatively nice results thanks to Nokia’s expertise. Video is basic, shooting at just 15fps. The lack of Wi-Fi has the twin effect of keeping costs down and marking the C5’s niche as a voice-centric phone. The small amount of storage space can be expanded by investing in a microSD card. For all its smartphone prowess, Nokia still excels at basic phones with a classic appearance and simple handling. The Nokia C5 does have a few extras, such as GPS, but it’s the easy operation and familiar, smart appearance that will appeal to most.